Elegance and classic design combine in this beautifully textured wave clawfoot tub to form the perfect union. This marble freestanding tub can be ordered in custom size for a larger design. It can be ordered with the clawfoot or pedestal option. Similar bathtubs can be viewed without the wave or clawfoot options that are pictured here. Overflow drain and soaking side are additional upgrades. Get a beautiful matching free sink in the same stone for free when you buy any tub. 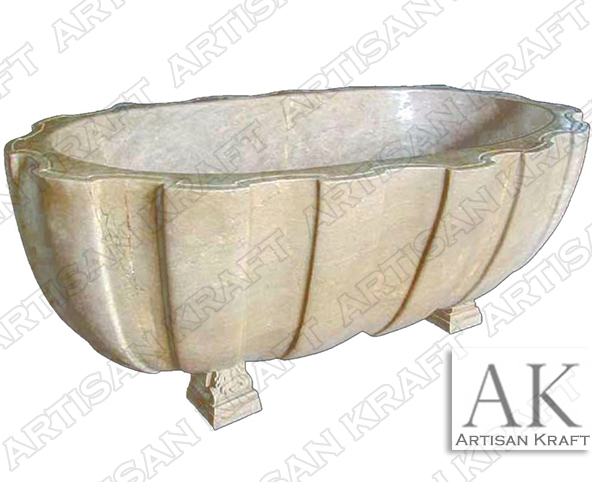 Artisan Kraft also offers copper tub designs.